Stop Trying To Kill Robert Downey Jr.! I'm writing to ask you to please, please stop trying to kill Robert Downey Jr. It's bad for cinema, bad for the box office (as this weekend will emphatically attest), and simply not a nice thing to do. Downey has noted that his recreational drug use in the 1980s did not spiral into a full-blown debilitating addiction until he played an addict in Less Than Zero. As the star recently told Starpulse, “Until that movie I took my drugs after work and on the weekends. That changed on Less Than Zero. The role was like the ghost of Christmas Future. I became an exaggeration of the character.” Downey’s subsequent addiction resulted in arrests, incarceration, and the near-demise of his acting career. Nobody wants anything like that to happen again, right? Yes, I know. It’s just one movie. It’s a coincidence, all one big misunderstanding. But how are we to explain the following? -- Then, it was the part of Paul Avery in Zodiac--a flamboyant reporter whose career falls apart thanks to drug and alcohol abuse. -- And now, finally, he gets to be Tony Stark in Iron Man. But what seems at first glance to be a career pinnacle--a great performance in a movie poised to make $2 gajillion--is just another step in your elaborate plot to undo him. Sure, he’s just amiably boozy in this one (though he puts down enough Scotches that one wonders if his Iron Man armor has retractable cup holders). 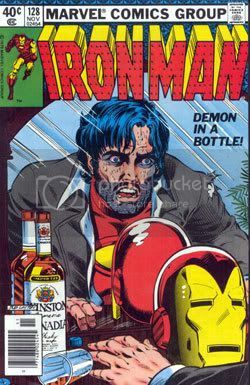 But, given that Stark is probably the most famous Marvel Comics hero to face serious alcohol abuse, it’s all too clear that within a sequel or two you intend to have him hammered out of his mind, waving his repulsor rays around and demanding that someone get him an Oxycodone. Seriously, guys: Please cut it out. Downey is a terrific actor and seems to be a nice guy. Find him a role as a yoga instructor or the owner of a health food store. Let him play a vegan FBI agent or a Seventh Day Adventist shock jock. Make him Captain Frickin' America. But this has got to stop.